i have been perplexed over the past couple of years over thank you notes. Its not about writing them, its about receiving them, the lack thereof that is. When i was growing up, writing thank you notes was a requirement. my mother would not let us open presents, any presents (Christmas, birthday, etc. ), without having a notepad and pen to write down who had given us what, so that we would be prepared to write thank you notes later that day or the next, at the latest. We wrote them out, usually on handmade drawn cards when we were kids, and took them to Mom to go over and mail off. We often dreaded this, but knew it was a requirement, grace and acknowledgement for someone spending the time to get us a gift or do something special for us. i continue this practice as an adult. To me, its what you do, the right thing, and i don’t even give it a second thought. 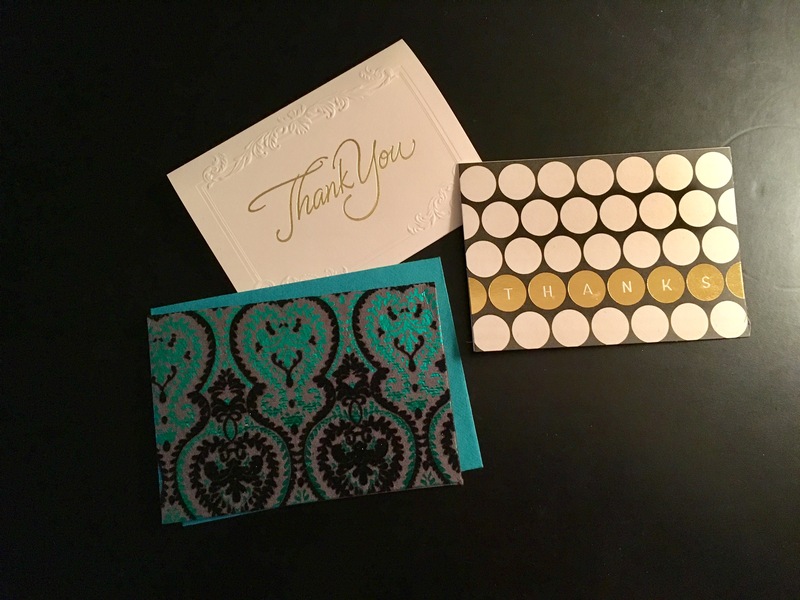 i have a collection of pretty thank you and blank note cards and sit down right away to write a little note to friends, family, others who have done something nice, such as giving us a gift or inviting us over for dinner or a party, coming up to visit for the weekend, etc. i admit that sometimes i do send an email thank you, if the situation warrants it, such as sending a note on FetLife to thank the host of an event or to others i’ve met and want to thank them for their kindness and future friendship. But generally, i hand write notes, even to my family. i leave them on Maximus’ desk for Him to go over and sign, and then i mail them off. But i rarely receive any. At most, i get them from wedding/baby showers, but not other gifts given. Why is that? What happened to etiquette? It irks me, and i think, “am i so old that i am doing something completely old-fashioned and out of mode?” i don’t think so. i did a little research on it and found an article on AARP that said newer generations do not appreciate the thank you note. The same with an article on Good Housekeeping. Those are just two of many. But i just don’t buy into this generation’s thought that we should ignore good etiquette and stop being mindful and appreciative–because that’s what a thank you note is. 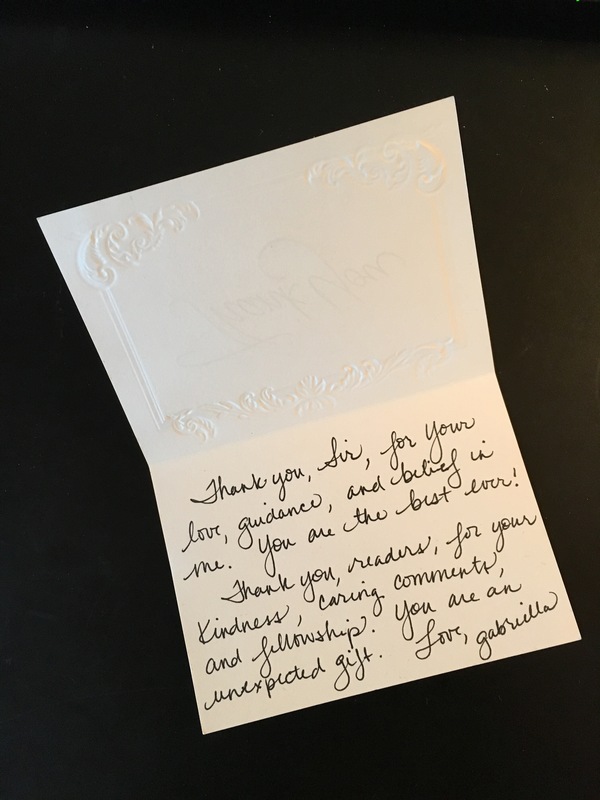 The Emily Post Institute concurs, thank you notes are just good practice and the right thing to do. Perhaps we haven’t done a good job at teaching our future generations they why and how of writing thank you notes. The first holiday i had with Maximus where we didn’t receive thank you notes from His kids or grandchildren, i was confused and asked if i had offended them or if they just don’t send thank yous, either in writing or by email. He assured me that they adored their gifts but that thank you notes were not a priority when they were raised–they go on the verbal thank yous when they receive the gifts. But this occurs even if i wasn’t around when they opened the gift, such as when i send a gift with Maximus if He’s off the see the kids or grandkids without me for one reason or another. i didn’t raise them, and i understand there is a difference in how i might have, so i don’t get offended anymore, but i am a wee bit disappointed. It doesn’t deter me from sending them thank you notes for our gifts, however. So rather than just complaining, i thought i’d share some resources on writing thank you notes, in case someone is struggling with how to do it.